Five Finger Death Punch guitarist Zoltan Bathory picks his all-time favourite Five Finger Death Punch songs for all you knuckleheads! With six studio albums tucked firmly under their bullet belts, Five Finger Death Punch aren’t short of a massive tune or two – just look at their recently released A Decade Of Destruction compilation album for proof! 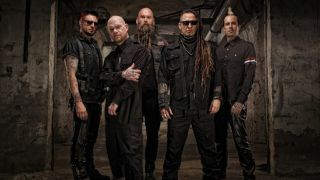 Often it’s hard to condense the sound of one band down to a handful of tracks, and not a task anyone takes on lightly, but when we asked founder member Zoltan Bathory to pick the ten best Five Finger Death Punch songs he was aaaall over it. So here we go. These are the best Five Finger Death Punch songs according to the man responsible.